Master in Pathology Entrance Exam: Interview Part. Congratulations to all that pass Master in Pathology Entrance Exam which was held on 14 December 2016. For those who does not, do not worry, there will be another one next year. There are no limit on taking this exam so it will be all good. I would also like to congratulate my wife on passing that exam. She was planning on taking Chemical pathology. Well, I believe if she does enter next June, our family would be a pathological family. Just remember, there is nothing pathological about a pathologist. This is why most pathologist are kind and warm hearted person. The pathological person usually will not become a pathologist. It could be good to our family then. So after the entrance Exam which was held in my place of study now, UKM, I met a few friends and colleague who have gone through the exam and the interview. Well, most who pass concern about their interview score. 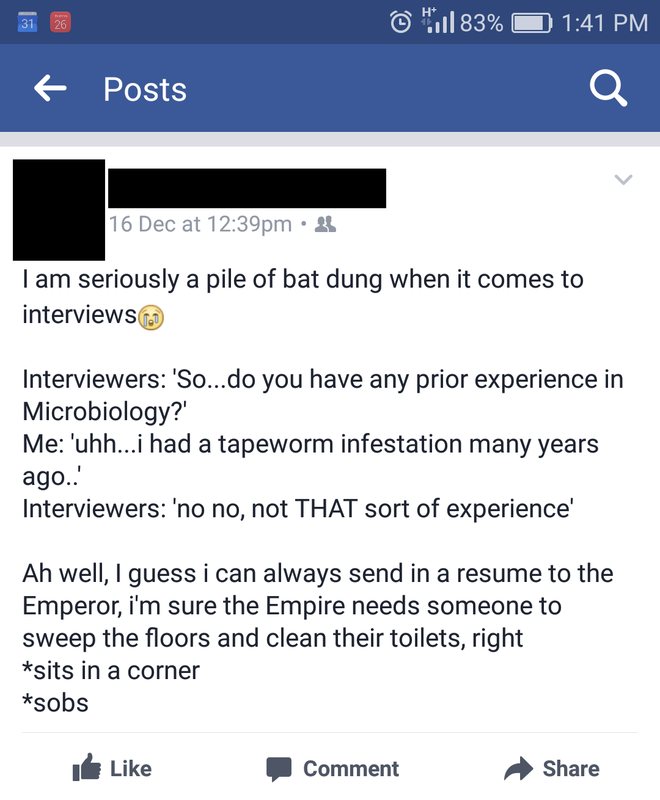 Most of them panicked during the interview and give all sort of funny answer. I was planning to write on the interview part of the exam but I was too busy myself trying to calm my wife for the interview. I believe she also panicked and give all sort of answer which I laugh after she told me later. For those who are planning to take this exam next year, you can take this as a tips or maybe just a random rant from me to give you the heads up on how are they going to interview you. I speak based on my experiences and experiences from other colleague who have gone through the exam. If you want to know the real information on what they want during the interview, you can ask the interviewer because I also do not know what exactly that they wanted to hear from us. First, you must know when the interview will be held, and what you need to bring along during that interview. That is the most important part. Then you must understand, why they held this interview anyway? Why take so much hassle to interview a lot of people if all of these people already score in the theory exam? Some university held their own interview at much later time (USM) for all the candidates that are accepted to join their university. So, double interview? You need to understand that this interview after you pass the theory paper, is held primarily by Ministry of Health. They actually will not interview you regarding pathology itself but they actually want to know you much better. You already passed your paper so no need to doubt on your knowledge. They want to see your attitude, aptitude, your trainability. They already told this in Mock Entrance Exam. So the question now will be very general. Remember, they are two thing that they want to give to you at the end of all this. One, money for you to continue study (they will pay your salary, your University fee, exam fee, even give you Cost of Living allowance) so think about a person who want to give you free money (or lend money), how are you going to answer them if they ask you how are you doing? Second thing, they want to fill all those empty vacancy around Malaysia. All those places in Sabah and Sarawak who need Pathologist, they need to put someone to work there. Where to find someone? You are the one. So all the candidates now passed their theory, so they want to ask whether you are a good candidates to be given money to study and be able to work back for them in the future. So, by remembering this fact, your answer will be different. When someone ask you whether you are hungry, you will answer 'Yes, hungry for knowledge and experiences'. If someone ask you where you want to work, you will answer 'I am willing to work anywhere'. If they ask further on how about your family? You will answer ' Forget them, I am going for it no matter what'. Different answer will come out from you if you know the person infront of you wanted to gave you money but want you to serve them later in a place you probably never heard of before (are you even Malaysian?). 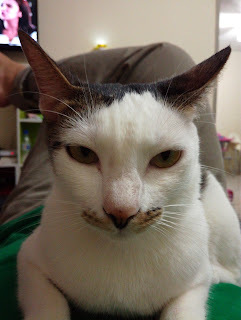 I am a bit exagerated here. Don't answer like that, but use that spirit. With that spirit to answer like that, take a deep breath and now come back to reality. You must answer based on reality. Don't answer ' Yes I am willing to work even on the moon if I have to'. That would be unrealistic. Or some candidate might answer ' I will not marry for 4 years time, or I will not get marry ever until I finally settle at my allocated work place', this is also unrealistic. Or even answer ' I will not have another baby until I finish my study'. All of this unrealistic. Be honest a bit. Realistic and a bit of honesty will make you superb in the interview. You might answer ' I can't say that I will not get marry along the 4 years of study, but if I do, I still can focus on my study, that would be a motivation for me to study harder'. This is realistic, and a bit of honesty. Not total honesty because if total honesty, you will answer that you will take 6 months off for honeymoon. That is what you actually want. But just a dash of honesty to make thing a bit funkier. If the answer is too bitter even with a dash of honesty, don't lie, but speak from your heart. If they ask you whether you wanted to work in Sabah or Sarawak which is very far from your family , just say ' I need to think a lot about that because my family / husband is here, I am willing to go but I cannot answer for them. Maybe have to make a bit of adjustment later'. Don't lie and say " I will, forget my husband, I will find a new one'. They won't ask much about your knowledge on pathology or experience, but they can ask that. For those who are from Pathology department, that's a bonus question. But, for those who never work in Pathology before (most of the candidate now), you can take example from what a philosphy that I read when I was studying medicine. I forgot who say it but I remember it. "Its better to come to a place with an empty cup rather than a full one. Because an empty cup can be filled with whatever new thing you will encounter. A full cup will have no use later". "The best property of a cup is when it was empty". This philosophy can be used to give an impression to the interviewer regarding how willing are you to learn more even though you do not know anything about that field. Don't talk about a cup nevertheless. When you are panic, sometimes, you remember this philosophy but you end up spending 10 minutes just talking about cup. Speaking about that, times is always your enemy. There will be no time limit for an interview. The quicker the better. So please be aware of the time even if they did not ask you to. Answer as brief as possible. Aim to finish the invterview within 5-10 minutes. Not more, nor less. Less time will make you loose your point to impress them. More time means you are digging your own grave. If it was already past 10 minutes, please look somewhere else, take a deep breath, and start thinking how deep your grave has been dug. Try to stop or get out from it. A few standard question they will ask is about your role later as a specialist. There was a scheme on that. Just read it or ask those who work in pathology before. Help physician to make diagnosis, to make sure you provide a quality result, to provide a quality service, quality control, bla bla bla, continuous education to stuff, and bla bla. I am into pathology because I am very interested in it. So all this answer for me is just a bla bla bla. When you love someone, you do not need to read or ask others on what you are going to do with it. You just automatically know what you are going to do. So, I can't really remember all the answer scheme but I know what to do.This part, you lean it by yourself. You can even google it. For example google " Role of a Chemical pathologist". The last thing is to be prepared. Make sure you make your own CV and bring it along. In that CV you will write in a point form or in a table all the experience that you have, good thing about you, your interest, your hobby even if you want. They won't ask for it but this make you feel confidence when you enter the interviewer room. Don't look too smart unless you are naturally born smart. If you end up looking too clever while you are not, they will catch you. Just be yourself. Dress appropriately. Do not need to wear coat like you are going for CEO position. Just plain simple, not too exposing for female because the interviewer were usually female. So using your body as a tool here will never work. Use a nice shoes, not high heel. Dress confidently. Wear tie for male, don't forget that. Wear tie, not to bright colour shirt, clean shoes, shaved, iron your shirt please. Hold something in your hand, a file with your CV in it (that's another purpose for that), don't walk in there with an empty hand. For female, usually they will bring their big handbag, good for them, but just hold a file for whatever reason. Holding a file make you look that you are going for an interview seriously. Don't bring bags. You will have no place to put your bag later. Some candidates bring their luggage because, for obvious reason, they were catching flights after the interview. If you do, leave that outside the room. If possible, be comfortable when you go for that interview. For me, holding a file and leaving all my bags in the hotel was a good enough. That's all you need. Pray before the interview could be a good idea. One last thing, do not show your emotion during that interview. I was asked last time on what should I do if I was accepted in Master program and my children and my wife have to stay in Sabah. I am pretty emotional about that question but I try to control it (I am not very good at expression. My face will look the same in any emotion. Good for me). I answer them " I have to think about that, maybe I will ask my wife to join master program and migrate here with me later. That maybe took sometimes, as for the time being, we have to live separately until we find the solution". For Sabahan, you are lucky enough because Sabah still have low level of Pathologist through out Malaysia. You can count the pathologist there which covering the whole Sabah. So if you are Sabahan, you do not need to try hard in that interview. Just relaxed, and say 'I have no other place to serve other than serving my own people there in Sabah'. High score for you. Pretty unfair. But what to do. For Sabahan, your sacrifice will be during 4 years of Master study. For Peninsular Malaysian, your sacrifice will be after you finish that 4 years study. It will be fair somehow later. This post is a bit late. But I hope next candidate for Master Entrance next year can answer less funnier than what we answer last year or this year. It's a mind game. Don't lose it. This is the picture of an interviewer when you start saying that you are not going to get marry or have children during the 4 years study program. In her mind she was saying "oh really? You think your hormone can be supressed by just saying that?" hahaha. 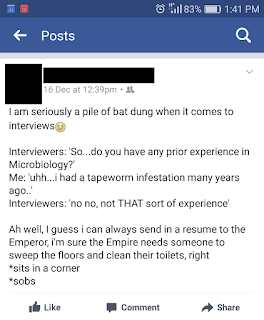 A jokes from a friend of mine regarding her interview. I don't think she mind when I share this, but I just block name and picture. It s a very good joke and example on how panicked you will be during interview. Master in Pathology: A Guide To Apply. Thank you, this is really helpful. Your master patho entries are really helpful for me. I'm thinking of applying for it this year, but I have no experience at all in patho. It's better if you have experience in pathology first. However, it wouldn't be a problem if you don't have experience. Just try to get to know what they are doing in patho. Do attachment. If you have friends in patho, try to get their experience. If you really like patho, then there are a lot of ways for you to get to know that field. If you apply this year, then the entrance will be next year, still a lot of time to go. Are you still practicing real medicine?